Weddings are such special times for everyone around the bride and groom. I do my best to respect the registry because I want to get something that the couple really wants or needs and anyone who has been there knows that it’s great to return duplicates or anything you change your mind about in one place. That’s how I got our Dyson DC-14, after all. However, as a gift-giver, registries can be sooooo boring. I like to give off the registry and throw in something hand-made as well. Yes, everyone needs pots & pans, dishes, and linens, but everyone loves something thoughtfully handmade and personalized. That’s where my Silhouette Cameo comes in. I’d seen versions of this project floating around and I’ve been dying to etch all of our pyrex dishes that we bring with us to events. Since the bride & groom didn’t have any of that sort of thing on their registry, I bought them a pair of simple stemless wine glasses – since you know, you can use those for just about anything. 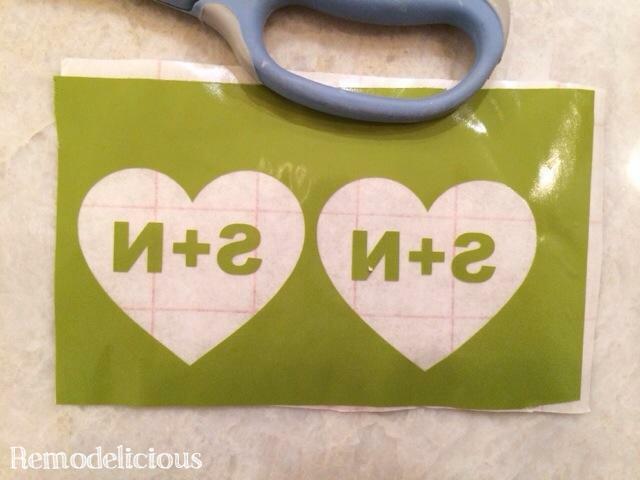 Step 1 is to create a vinyl stencil with your Silhouette or other craft cutter. 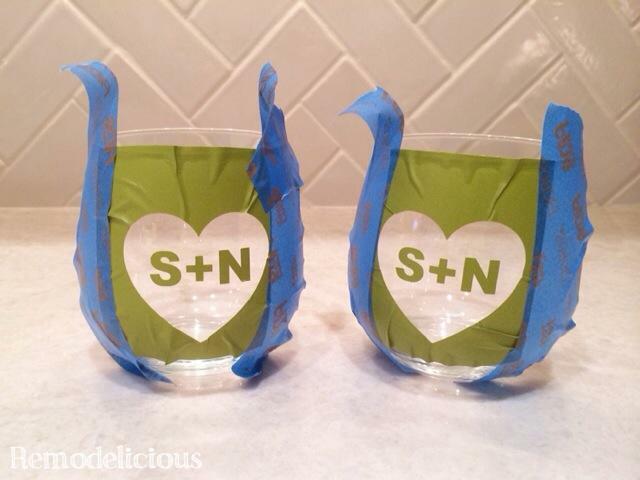 I downloaded a simple heart from the Silhouette library and used the font that everyone should have, “Arial Black”, to add the text “S+N” (the couple’s first initials). I selected the heart and the text, copied it, and pasted it. I also created a box around both hearts so I could easily remove these two stencils and save as much vinyl as possible – you know, since being a Silhouette owner turns you into a vinyl hoarder! The photo below shows my finished vinyl stencil, sticky side up. Note… Lesson learned: my hearts should be spaced farther apart to leave more room on both sides. For Step 2, stick the vinyl onto the glass. If you screw up and don’t leave enough of a border like I did (or are just being stingy with your vinyl), blue tape works great to add some extra width to your stencil. Note… Lesson learned: Get ALL of those wrinkles out around the design. You may need to stretch the vinyl slightly. The wrinkles not touching the design are no big deal, but the ones next to the design will let the etching cream creep in. Step 3 is to apply the etching cream. Mine is really old, if it’s fresh it should be whiter and less clumpy. In case you were wondering, 5 year old etching cream does still work. The more you know! Anyway, the key with etching cream is to GLOB IT ON. If you can see any glass through the cream, it may look streaky or you may have a brush stroke mark or a spot where it isn’t “as etched”. I learned that lesson last time I tried this stuff and was really disappointed. I used an old artist’s paint brush for this and washed it off well with dish soap and warm water. You don’t want to get this stuff on your skin! You leave it on 5 minutes, I did 7 just to be sure since my etching cream was ancient. I used the “Armour Etch” cream from Michael’s. You can also buy it online here. For the Final Step, wash off the etching cream (be careful not to get it on your skin, it will burn), remove the vinyl, and wash it again. Here’s the finished product! I love these and want to make some for myself :-). I’m sure I will at some point. 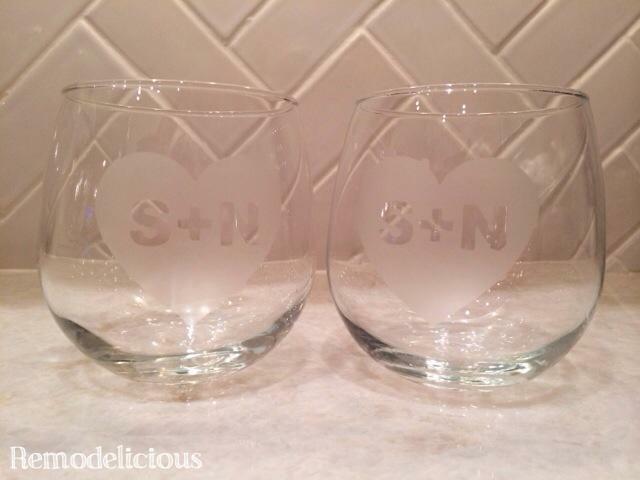 And yes, the bride loved them as well as her registry items! 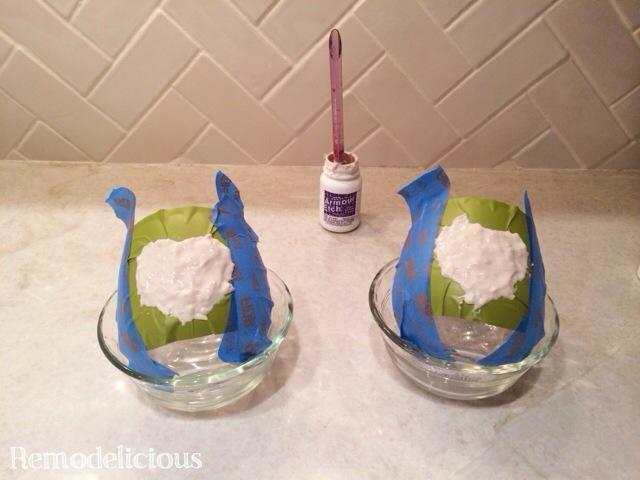 This is a quick & easy project that anyone can do with great results! If you have any questions or comments, be sure to add them below. If you love this post, be sure to share it with Facebook, Twitter, Pinterest, etc. 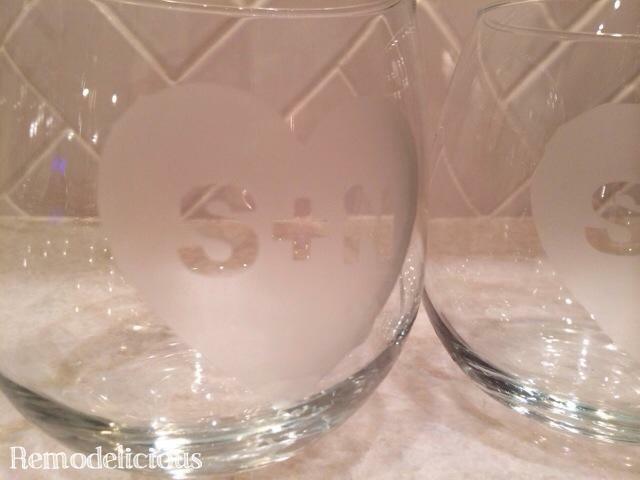 Glass Etching Silhouette Promotion & Giveaway!